Cecil AUSTIN was born in Spratton, Northamptonshire in 1898 and registered in Q4 1898 in Brixworth. He was the younger son of Ned Austin, who was born in about 1874 in Bradford, Yorkshire, and Nellie Benson, née Eagles, Austin, who was born in about 1876, in Spratton, Northamptonshire. They were married in Spratton on 3 August 1896. When Cecil was baptised at Holy Trinity church, Northampton on 17 October 1904, his father was working as a ‘boot maker’ and the family lived at 1 Cranbrook Road, Northampton. In 1901, the family were living at 49 Balmoral Road, Kingsthorpe, Northampton, and Cecil’s father, Ned Austin, was a ‘shoemaker – boot m[aker] worker’. In 1911, his father was enumerated as a ‘boot repairer’, and the family had moved to Rugby and were now living at 3 Oliver Street. Cecil was twelve years old. His parents had been married for 14 years. Cyril’s elder brother, Wilfred Austin, who was thirteen, was also a ‘boot repairer’. The boys’ 80 year old maternal grandfather was living with them. Unfortunately no Service Record has survived for Cecil, but it seems that he joined up in Rugby, and his Medal Card shows that he served as Private, No: 34801, and was latterly in ‘B’ Company, of the 1st Battalion, the Royal Warwickshire Regiment. There is no date on his Medal Card for when Cecil went to France, suggesting this was after the end of 1915, but it would probably be some time after he joined up and he was unlikely to have been sufficiently trained – or indeed old enough assuming he had declared his correct age – to serve overseas until sometime in late 1916. On 4 August 1914, the 1st Battalion of the Royal Warwickshire Regiment was stationed at Shorncliffe as part of the 10th Brigade of the 4th Division, and on 22 August 1914 they mobilised for war and landed in France. The Division engaged in various actions on the Western Front including during 1914: the Battle of Le Cateau, the Battle of the Marne, the Battle of the Aisne, and the Battle of Messines 1914. In December 1914, the Battalion took part in the Christmas Truce of 1914. During 1915 they were engaged in the Second Battle of Ypres. During 1916, they fought in the Battle of Albert, the Battle of Le Transloy. During 1917, they took part in the First Battle of the Scarpe, the Third Battle of the Scarpe, the Battle of Polygon Wood, the Battle of Broodseinde, the Battle of Poelcapelle, and the First Battle of Passchendaele. During 1918, when Cecil was almost certainly with the Battalion, they were involved in the First Battle of Arras, the Battle of Hazebrouck, the Battle of Bethune on 18 April 1918, the Advance in Flanders, and the Battle of the Scarpe – 26 to 30 August 1918. This would have been part of what developed into the advance, which became known as the Allies’ ‘Hundred Days Offensive’, and pushed back the German Armies along an extended front until the Armistice was declared. The 1st Battalion War Diaries are to be found with the within the records of the 4th Division at The National Archives and on-line. The events recorded in the Diary, for the last few days before Cecil was killed are summarised below. 28 August – Wet day. 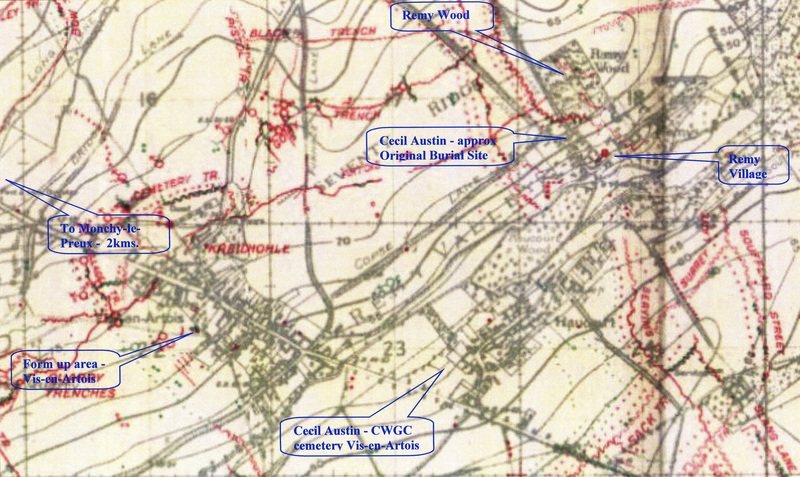 Orders … to relieve the 5th Bn Canadian Mounted Rifles at night in front of VIS-EN-ARTOIS. Battalion embus at MONT ST ELOI at noon & procede to ARRAS, [about 6 miles] … then marches to assembly area at FEUCHY CHAPEL [about 5 miles from Arras, and the same to Vis-en-Artois] … at 6.30pm Coys. move forward … keeping MOINCHY LE PREUX on the north … and relief is gradually carried out. Hostile artillery is very severe … & we suffer casualties. Relief complete about 2.30am. Among those O.R.s ‘Killed in Action’ during the attack on Rémy on 30 August, was Cecil Austin. He was 19 years old. When smaller burial grounds and battlefield graves were later ‘concentrated’ – the bodies exhumed, moved and reburied in larger cemeteries, which could be better maintained – the two soldiers were buried in separate graves. Cecil is now buried in Plot V. F. 25. in the Vis-en-Artois Cemetery, Pas de Calais, France. His former ‘grave-mate’ is buried next to him in Plot V. F. 26. Vis-en-Artois and Haucourt are villages on the road from Arras to Cambrai, about 10 kilometres south-east of Arras. The Vis-en-Artois Cemetery is west of the village of Haucourt. Vis-En-Artois and Haucourt were taken by the Canadian Corps on 27 August 1918. The cemetery was begun immediately afterwards and was used by fighting units and field ambulances until the middle of October. It consisted originally of 430 graves (in Plots I and II) of which 297 were Canadian and 55 belonged to the 2nd Duke of Wellington’s Regiment. It was increased after the Armistice by the concentration of graves from the battlefields of April-June 1917, August and September 1918, and from the smaller cemeteries in the neighbourhood. … The cemetery was designed by J R Truelove. His parents had the inscription ‘A Loving Son Tender and Kind, A Beautiful Memory Left Behind’, engraved on his gravestone. … THE ROLL HONOUR. Coventry and District Casualties. The following are included the latest casualty lists: Killed. Austin, 34801, C. (Rugby), R.W.R. This tablet and the organ in the Church are erected to the memory of those members of this Church who laid down their lives in the Great War 1914-1918, whose names are given herewith also as an act of thanksgiving for the safe return of the many others from this Church who served in the war. On waters deep in the treacherous mud. They kept the honour of the land. After the war, Ned and Nellie Austin had moved to live at 11 Bridget Street, Rugby. This article on Cecil AUSTIN was researched and written for the Rugby Family History Group [RFHG] project, by John P H Frearson and is © John P H Frearson and the RFHG, April 2018. Coventry Evening Telegraph, Friday, 4 October 1918. This entry was posted in Biography and tagged 1918, Austin, Royal Warwickshire Regiment, Spatton by Christine. Bookmark the permalink.